Last week, our CSA box contained wheatberries. 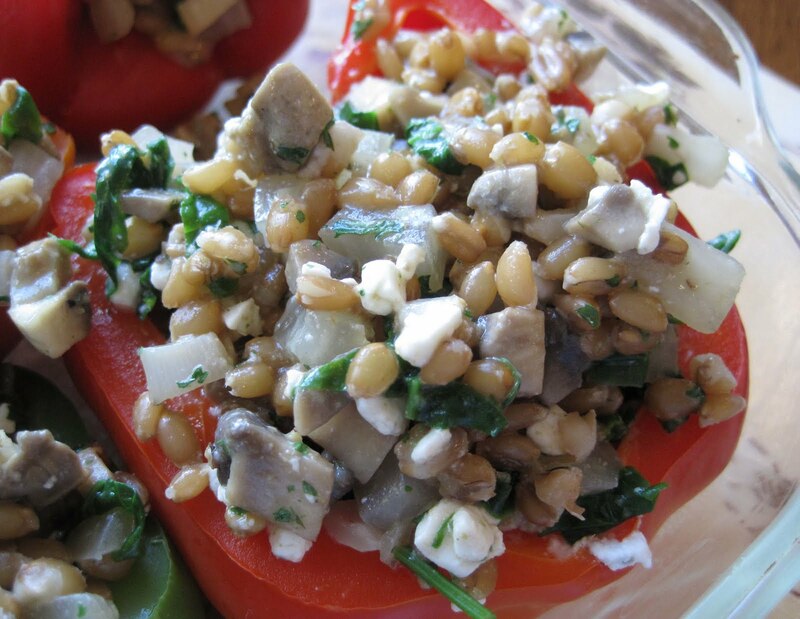 I had never before eaten wheatberries, and I wasn't sure how to even cook them. Mike suggested I use them in a salad, and that definitely sounded appealing, but I was curious, I needed to know all about these little guys, I had to see all the possible recipes. The magic information powers of Google beckoned. First, what is a wheatberry? It's the entire wheat kernel. Second, wheatberry recipes. There are a lot of wheatberry salad recipes out there! One of them caught my eye. 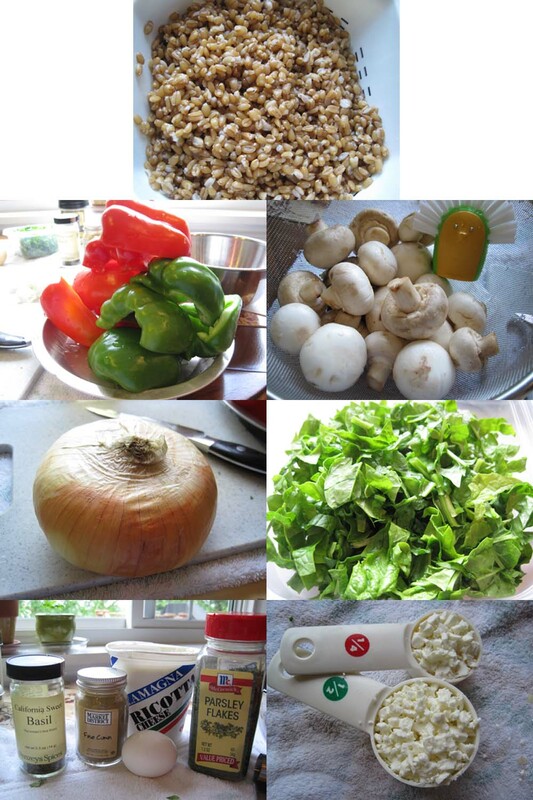 It's from a site called Doctor Grandma's: Healthy Living Through Good Nutrition. 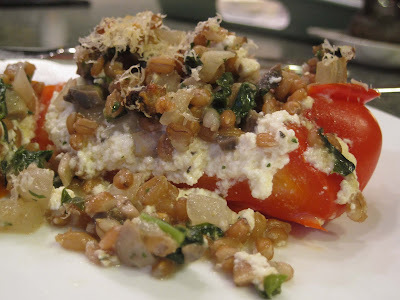 There are several wheatberry recipes at Doctor Grandma's, but SP & I had been discussing making stuffed peppers for a few months now but have never quite managed to get past the discussing part. 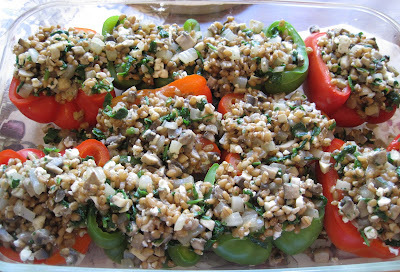 So these wheatberry stuffed peppers sounded really good. 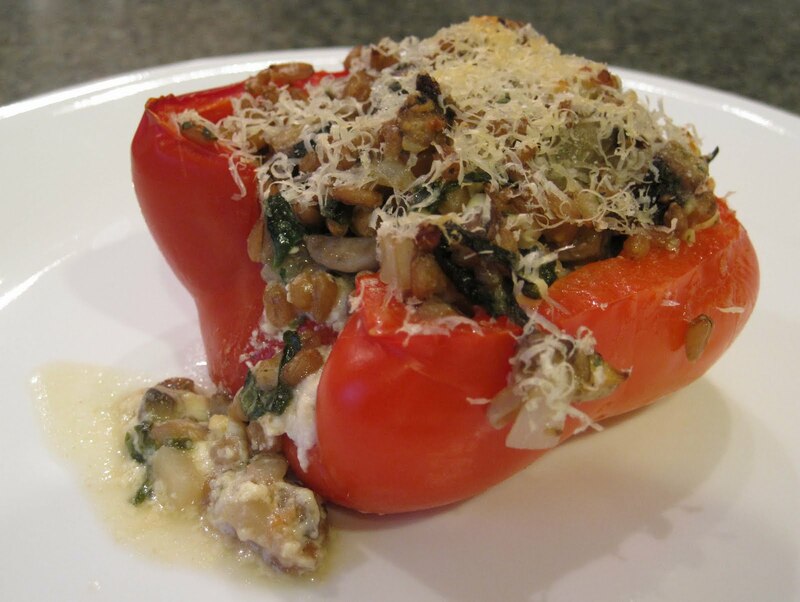 The recipe is called A New Twist on Stuffed Peppers. *I have seen wheatberry as one word and as 2 words; I decided to type it as one word instead of two. 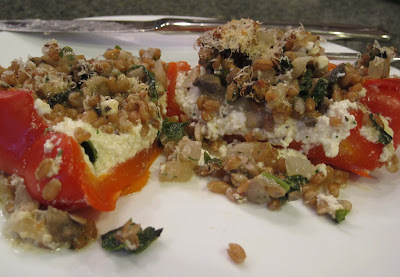 The ingredients: wheatberries, mushrooms, onion, spinach, parsley, cumin, feta, bell peppers, ricotta, egg, dried basil, Parmesan. We omitted the garlic. 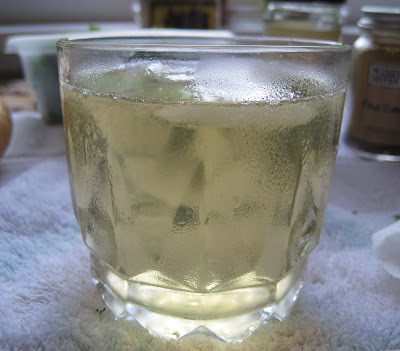 This was the second of two dinner meals we prepared on Sunday, so it was about time for a Sunday cocktail. I opened our new bottle of VO and SP made me a whiskey, soda, and lemon drink. Mmmm yum! Fortified with beverage, I started washing and slicing and chopping everything. We cooked the wheatberries earlier in the day. I don't remember the exact water to wheatberry ratio, but basically they simmer in water for at least an hour. Here's our ricotta, egg, and basil filling: I felt like we were making lasagna! 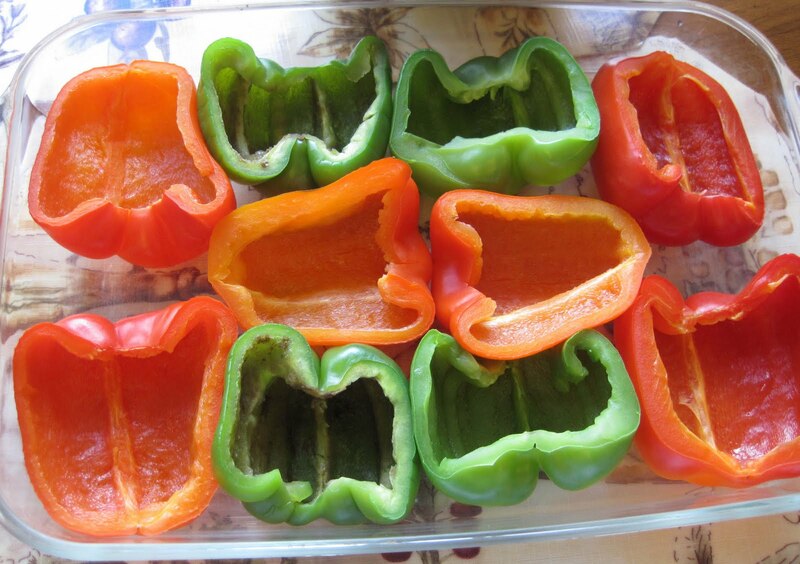 We used two green peppers and three red peppers. 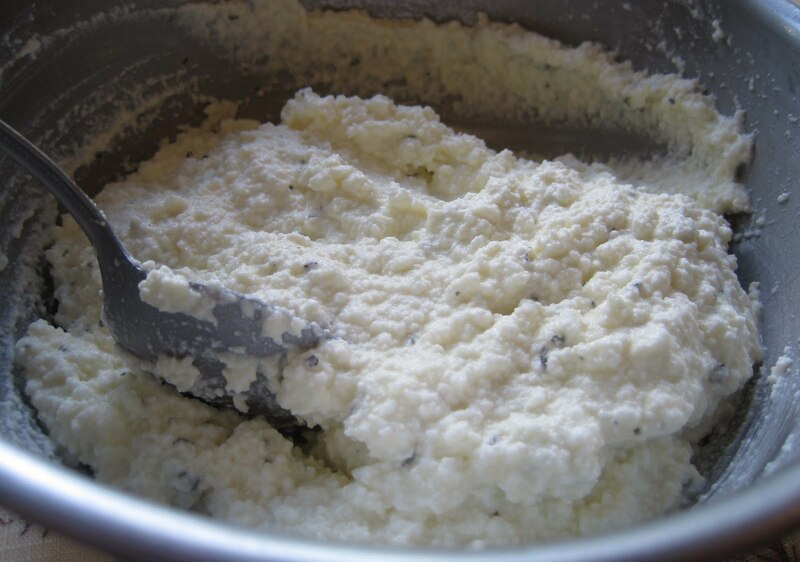 I stuffed them with the ricotta. 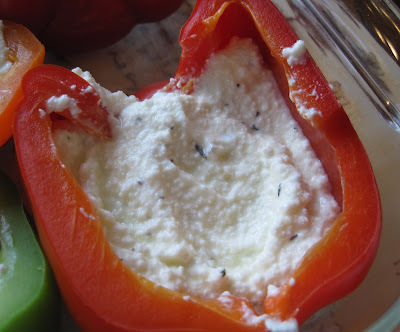 I thought at first that there was way more ricotta than five peppers could handle, but amazingly, it squishes down into the pepper nooks and crannies and we used all of it. Meanwhile, SP was making the wheatberry filling. It's pretty simple: saute mushrooms & onion with cumin (we used twice as many mushrooms as the recipe calls for), add the spinach and stir until it wilts, remove from heat and add parsley, wheatberries, and feta. 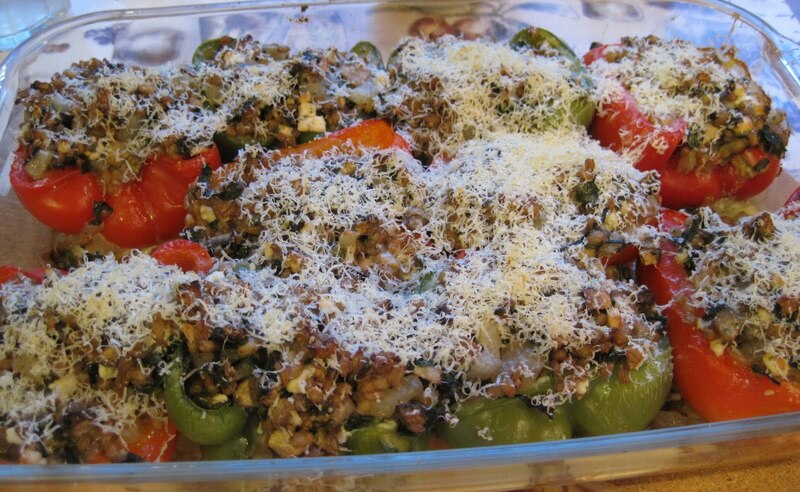 When the wheatberry mixture was ready, I spooned it on top of the ricotta in the peppers. 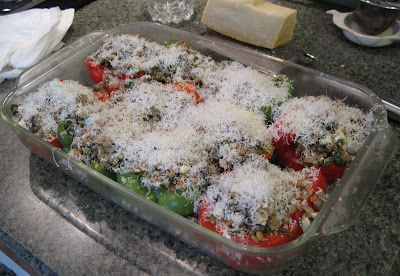 We used all the filing and then we set the pan of stuffed peppers in the refrigerator because we were not quite ready to bake and eat them. At dinner time, SP drizzled on the additional olive oil and sprinkled Parmesan on top before baking them. Here they are, heated through and with browned Parmesan on top: They looked yummy. But first, the food photographs. I think this is the kind of dish that, for me, given my camera and my camera skills, no matter how I positioned things, no matter what kind of light I tried to give them (evening sunshine, kitchen overhead lights), flash or no flash, any angle, the photos just do not do the dish justice. It looked much prettier and mouth-watering in person than it does in these photos. I finally quit fussing with the camera and my plate of stuffed pepper and dug in. These are filling! I was surprised but just one stuffed pepper was enough for me. Two were enough for SP. Of course, we'd been 'grazing' on ingredients all day, and tasting as we cooked, so maybe we a bit full before we sat down to dinner. 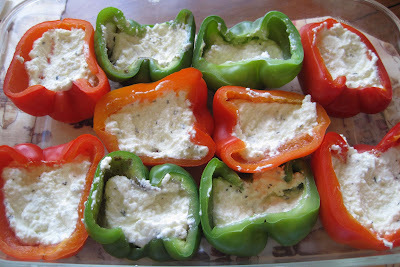 These stuffed peppers are quite tasty. 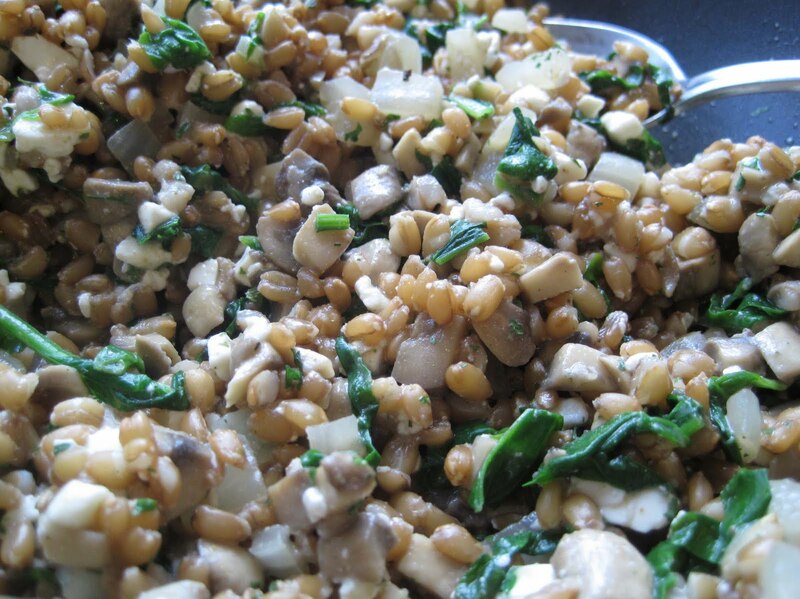 The wheatberry-mushroom-spinach mixture is really good. We decided that we really couldn't taste the cumin, but that if we had left it out, it's absence would be obvious. I think next time we might add a generous, rounded teaspoon of cumin, keep the mushrooms doubled, add a bit more feta (it kind of got lost in everything else), and maybe do orange/yellow peppers instead of green. We used all of our wheatberries and I find myself hoping we get some more in a future CSA box (or we just buy some at the store! ).